Labor’s on the brain lately, thanks to Ben Davis’ 9.5 Theses on Art and Class and Martha Rosler’s Culture Class. 1. “Hurry up and wait.” Art laborers’ time is expensive yet expendable. Waste is part of the process of productivity. 2. Exhibition-making is a combination of office work and gallery work; the contrast between salaried/white-collar and hourly/blue-collar workers’ valuations of time, modes of employment, and precariousness is telling. 3. Help others help you with clear directions. Experience and decisiveness are not co-developed skills. 4. If the risk of confidence in excess is egocentrism, safeguard with humility and gratitude. 5. The more powerful you are, the more tardy you can be. 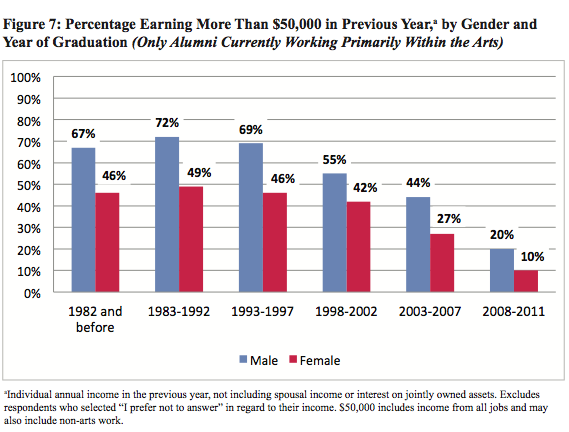 Female alumni are less likely than male alumni to ever work as artists and to do so currently. Across all racial/ethnic groups, Black graduates and Hispanic graduates are the least likely to ever work as artists—with 76% of both groups ever working in this capacity. Black and Hispanic alumni are much more likely to cite both lack of access to networks and debt (including student loan debt) as barriers to artistic careers, compared to White respondents. SNAAP reveals sharp disparities in earnings by gender. Among alumni currently spending the majority of their work time in an arts-related job, men out-earn women. For example, among undergraduate-level respondents who currently work primarily within the arts, 56% of men earned more than $50,000 in the past year—compared to 36% of women. SNAAP uses the labels “art” and “artist” to refer to a broad spectrum of practicioners, including performers and creative writers. They also include workers in fields that often hire salaried employees, such as in architecture, design, film, illustration and animation—which I would consider creative industries (see also Ben Davis’ recently published 9.5 Theses on Art and Class, 2013). Differences in the artistic fields … partially account for some disparities between groups. It’s easy to misinterpret this bar chart as showing the reduction of income, and gender-based pay disparity, over time. What it actually shows is gender-based pay disparity in 2011 according to graduation year ranges. Those who graduated in the 80s and 90s (who are likely older and further along towards maximizing their earning potential) see the highest gender-based pay disparity. For the most recent grads, the there is relatively less pay disparity in percentage points, but, in this cohort, you could also say that the number of men who earned $50k is 100% more than women. One salient feature of this graph is that male artistic workers out-earn females within every cohort group. …income differences are not simply the result of men’s and women’s different work commitments, but rather reflect persistent patterns of discrimination. Furthermore, these data provide compelling evidence that gender inequalities continue to exist for the newest graduates and are not simply a relic of an older time. SNAAP’s wide definition of “artist” may be useful for including the majors offered at its member institutions, but its analysis can only be applied to fine artists with remote and questionable extrapolations. The fine arts is worthwhile of analysis as its own data subset. The fine arts are exceptional. In other words, the economics of fine arts operates does not follow any logic found in other fields (see Hans Abbing’s Why Are Artists Poor? The Exceptional Economy of the Arts, 2004). Most pressingly, the fine arts are well-known for its huge disparities. The vast majority of artists work non-art day jobs to support their art practices, while only a tiny fraction of artists garner dramatically higher income levels from their art sales. Thanks to the media’s obsession with auction sales, gender-based income disparity is well-documented for the highest earners, but this data ignores most working artists. SNAAP’s subset of data relating specifically to contemporary fine artists is robust, according to the interactive SNAAP Shot 2012, with about 21,000 respondents who majored in Studio/Fine Arts. This is no small data set. SNAAP should make this data set freely available, like many contemporary federal- and city-level governments, or the UK Guardian, for statisticians and information graphic designers to interpret and share. What can be learned about the lives and working conditions of contemporary fine artists? What percentage of fine artists’ primary means of income is from their art? For fine artists whose primary means of income is not based on their art, how much of their income is? How much gender-based income disparity do fine artists experience? How does this change over the graduation-year-separated cohorts? What are the breakdowns of racial inequality in the fine arts—how many artists of different races persist into the field of fine arts, over what period of time, and to what degree are they able to transition their art-making into a viable profession? In addition to comparing people of color and women to the responses of White men, I’d like to see intersectionality integrated into this report—what can we learn about the experiences of women of color?